Qualifies for the 30% Federal Tax Credit or 30% Renewable Energy Grant and other incentives. Using large volumes of water? Solar Preheating will save you money! Hospitality industry- Including resorts, hotels, motels, restaurants and theme parks. Laundry, dishwashers, bathrooms, pools can be made more efficient and less costly to operate with a solar preheating system. Hospitals and medical clinics and nursing homes- The cost of producing large quantities of hot water required by these types of facilities can be substantially reduced by a Superior Solar preheating system. These facilities normally generate payback back within 2 ½ years. Car washes- With large amounts of warm water generation, a solar preheating is a tremendous benefit. Depending on the volume, a direct circulation system with no heat exchanger could cut down on the investment cost. Solar preheating is a supplement to conventional water heating systems not a replacement. The systems work in conjunction with the facilities existing equipment by reducing system strain and gas or electricity needed to power it. The result is a dramatic reduction in energy consumption, carbon emission and equipment wear at a very affordable price. Solar preheating systems designed and installed by Superior Solar uses low temperature unglazed solar collectors made of UV stabilized polymers for use as solar panels. Water or other liquids circulate through the collectors absorbing the heat from the sun. The heated liquid is then either directly added to the conventional system or through a heat exchanger. 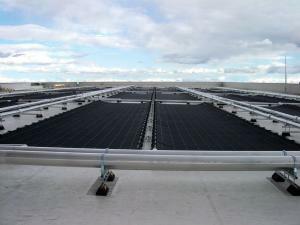 Our team of solar system engineers has designed some of the largest solar water heating systems in the world! This is a very simple, quick and cost effective way to become more energy efficient. Systems qualify for the Federal Tax Credit and are exclusively sold, designed and installed in Central Florida by Superior Solar Systems. Call us for a free commercial solar preheating evaluation today!